Installing Ubuntu 12.10 on a Samsung Series 9 Notebook has some pitfalls. My goal was to install Ubuntu 12.10 along Windows 8 while using Secure Boot too. The first challenge is booting from an USB flash drive. You need to enter your BIOS by pressing F2 while booting the system. Change to the “Boot” tab, enter the sub menu “Boot Device Priority” and move “USB HDD” in front of “SATA HDD” (using F5). Then, curiously, you also need to disable the “Fast BIOS Mode” (tab “Advanced”). You can also use F10 to select the boot device, but “Fast BIOS Mode” still needs to be disabled. Installing Ubuntu should then work as usually. Image failed to verify with *ACCESS DENIED*. Ubuntu 12.10 supports UEFI secure boot. I did some research in order to understand the actual implementation on Ubuntu and would like to share my findings. Since Windows 8 requires secure boot, most new Computer contain Microsoft’s Platform Key. Microsoft allows to sign own binaries with this Platform Key. As outlined in the Canonical blog post Ubuntu 12.10 uses a signed version of the EFI application Shim (to maintain the chain of trust) and Grub2 as its default boot manager. 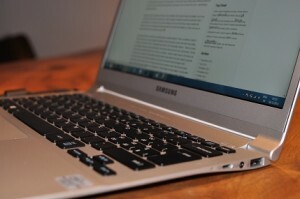 This week I got myself a Christmas gift: A shiny Samsung Series 9 Ultrabook (or Notebook, what they call it). My device came with a Sandisk SSD U100 128GB, 4GB Memory, HM75 Chipset and the Intel Core i5 3317U Processor. The device looks very nice and feels solid. I like the non reflecting screen very much, the resolution of 1600×900 feels right for the screen size (13.3″) with default DPI settings. Finger prints don’t remain on the outside of the device, but you can make them out on the keyboard. The lid shuts very well, but its a bit hard to get a grip on it to open again. The track pad is big, scrolling using multitouch gestures is very nice to use. Sometimes the track pad fires a click when I just try to move the cursor… Nevertheless, really solid hardware!